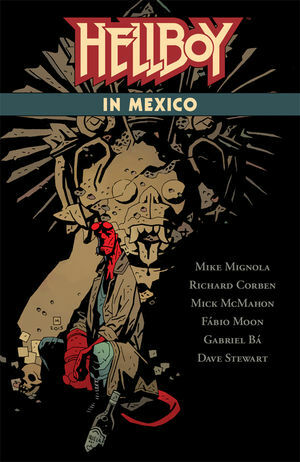 “Hellboy: Hellboy in Mexico (Or, a Drunken Blur)” [SYNOPSIS]28 pgs. s-Mike Mignola. a/r[Hellboy #46: Hellboy in Mexico (2010)]-Richard Corben. c-Dave Stewart. l-Clem Robins. “Hellboy: House of the Living Dead” [SYNOPSIS]49 pgs. s-Mike Mignola. a/r[Hellboy: House of the Living Dead (2011)]-Richard Corben. c-Dave Stewart. l-Clem Robins.